Grower trials and practical experience have shown that applying a carefully selected combination of amino-acid based biostimulants plus gibberellic acid produces valuable extra bite early in the season whatever the weather, but particularly when crops are stressed. Grass may have begun to grow away during the mild spell in many parts of the country in late February, but with several weeks of winter, it may well need a helping hand to bounce back after the next cold spell hits. And, given that many farmers were also left short of forage this winter after last years’ drought, maximising grass growth this spring will be more important than usual, says Agrovista technical adviser Matt Siggs. Later applications after each silage cut have also been shown to speed up regrowth and produce valuable extra yield and quality. To encourage early bite, a combination of Terra-Sorb Foliar Plus, an amino acid-based biostimulant, and Smartgrass, a patented formulation of gibberellic acid, has proved highly effective. 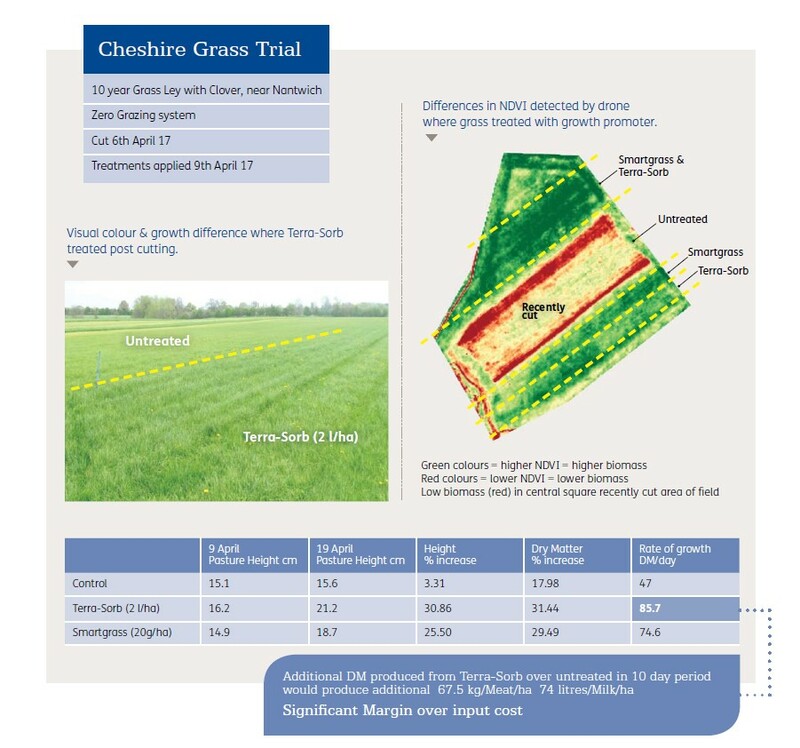 “In trials and on-farm, we have seen some dramatic visual and quantifiable differences from improved grass growth and dry matter output,” says Mr Siggs. Terra-Sorb provides a direct supply of readily assimilated amino acids, which help mitigate the effects of deficiency, stress and drought. Amino acids penetrate plant cells, increasing their photosynthesis activity and raising chlorophyll content. They also regulate many metabolic processes in plants, boosting photosynthetic activity and root and shoot growth, as well as increasing vigour and plant development in spring. In addition, the gibberellins in SmartGrass stimulate cell expansion, resulting in stem and leaf elongation. In a grower trial in 2018 in Suffolk on short-term ley under a standard fertiliser regime, Terra-Sorb Foliar Plus was applied on 8 April at 2 litres/ha plus Smartgrass at 20g/ha. When assessed on 20 April the treatment had produced a 23% uplift in dry matter compared with the untreated control (4971kg/ha c/w 4055kg/ha). When assessed again on 8 May, the treated grass still contained almost 8% more dry matter than the control (6915kg/ha c/w 6427kg/ha). The trial mirrored four other trials in 2017 and 2018 in the east and west of the UK that showed an average 20% increase after 24 to 28 days, an overall uplift of 874kg DM/ha. That equated to a £117.47/ha return on investment. Smartgrass cannot be applied later than the end of April. However, Terra-Sorb Foliar Plus still produces some impressive results when used alone on grassland aftermaths, says Mr Siggs. In one trial at Weybread in Suffolk in 2017, a grass ley area treated with 2 litres/ha of the product on 1 June produced 18.5% more dry matter (4402kg/ha c/w 3715kg/ha) than the untreated area. “That reflects findings from a range of trials in east and west England that recorded an average uplift of 17.4% in dry matter,” says Mr Siggs. Based on Agrovista trials and experience, he recommends applying 2 litres/ha of Terra-Sorb Foliar Plus and 20g/ha of Smartgrass at the start of spring growth, followed by Terra-Sorb Foliar Plus alone at 2 litres/ha to grassland aftermaths, when it can tank-mixed with herbicide. Terra-Sorb Foliar Plus is an amino acid-based biostimulant extracted from vegetable protein plus trace elements. It contains 9% w/w of free amino acids and supplies all 18 of these essential amino acids in their biologically active L-form, the only form that plants can effectively utilise and assimilate. Terra-Sorb Foliar Plus is manufactured using a unique advances form of enzymatic hydrolysis. Although swards have started growing earlier this year, there is plenty of time for further cold spells, he warns. “If growth is checked by frost, grass will be slower to come away again. Growers should not be tempted to apply more early N as grass won’t be able to utilise it, which is costly and greatly increases the chance of leaching. Alex Radu, fruit technical manager at Agrovista, reviews the recent Under 40s Fruit Growers’ Conference trip to Chile. Get trials and technical updates straight to your inbox. © 2019 Agrovista UK Limited. All rights reserved.